In performance management, the managers try to figure out, the existing performance level of the employees and works on improving that level. It is a systematic assessment of the performance of an employee and using the assessment to better the performance over time. These three activities along with the feedback are the essence of the process, which when undertaken in an organized way, the process turns out as Performance Management System (PMS). As a communication system, it is developed to assist employees in succeeding. It not just requires direction, from the end of managers and supervisors, but also needs active participation on the part of employees. It makes sure that employees are known about their key job functions, aware of the performance level expected, get constant feedback on their performance, have opportunities for training and development, get ratings on their performance and reward thereon, in just and fair manner. North Carolina Rating Scale is a five point performance management rating scale, which guides the performance functions, expectations, and appraisals. Outstanding Performance (O): Performance level supersedes the expected level. The employee is doing an outstanding job and the performance goes beyond expected level, because of the employee’s efforts and skills. Very Good Performance (VG): Performance level fulfills established job expectations and in many ways exceeds it. Good Performance (G): Performance level of the employee, is in alignment with the job expectations set by the organization, the employee is said to be doing a good job. Below Good Performance (BG): The level of performance of employee meets a few job expectation, but not all the parameters are met. It is said that employee’s performance is at a minimal level and improvements are required. Unsatisfactory Performance (U): The level of performance is below a certain level, i.e. he/she fails to fulfill the established standards. It is said that the employee is not performing well at the level expected and requires high supervision and direction. 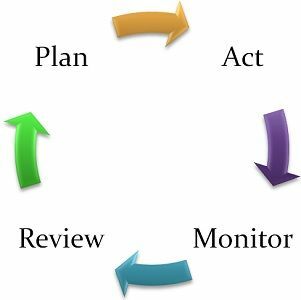 The primary focus of the performance management is towards the achievement of results. It highlights the difference between being engaged and producing results, meaning that, when one is busy, it does not mean that outcome is generated. It is often seen that employees seem to be very busy, but when it comes to performance, the results are against what is expected. So, performance management, is a must for every organization.